This article about taking students on field trips, near and far, concludes a short series in The Otter on teaching environmental history. I like field trips. I particularly like environmental history field trips. Environmental history courses are particularly well suited to field trips because of the emphasis on place and because, well, you can look at the stuff! So it is no coincidence ASEH conferences offer an extensive range of field trips (shameless plug alert: don’t forget to check out one I’m co-leading on Niagara Falls at ASEH Toronto), and the field trips are a highlight of NiCHE’s annual summer school (on Vancouver Island this year!). Research shows that field trips are, to put it simply, memorable. As a useful form of experiential learning, not only do students retain the things they learn, they retain it in unique ways. Mostly, I have found that students just “get it” after field trips – they see first-hand the magnitude, the scope, the scales, the degrees of the subjects. An added side benefit is that field trips help build camaraderie within a class, and between instructors and students. As the above quote indicates, there are many options for rewarding field trips. I’m lucky enough to teach close to my research (i.e. the St. Lawrence River/Seaway) and I’ve made sure to take students there, as you will see later in this post. But I also make use of even closer opportunities– I taught an Honours seminar on Canadian environmental history this past summer at Carleton University in Ottawa, and in addition to the St. Lawrence, we did field trips to Rideau Canal/Hogsback Falls and Lebreton Flats/Chaudiere Falls. Obviously, selecting an appropriate location is key – you probably want to avoid a trip to the box factory a la The Simpsons. But I would venture a guess that every single Canadian university campus has a number of things close that by that could make for an excellent environmental history field trip. The Rideau Canal bounds one side of the Carleton campus, and thus was an obvious field trip choice. I enlisted the help of Will Knight, a Carleton PhD candidate who co-developed a great app for the history of the Rideau Canal. This app had just been released, and it was a nice way of modeling the applicability of digital history. We walked along the canal from Dow’s Lake to Hogsback Falls. Students were tasked with exploring the landscape at Hogsback, particularly the falls and dam, to try and distinguish between what was “natural” and what was “manmade,” and despite the heavy rain, I think students were able to really grasp concepts such as first and second nature. For our LeBreton Flats/Chaudiere Falls trips a few weeks later, I asked Phil Jenkins, author of a great book on the Flats, to help interpret the area. Students were more than surprised to find out about the gritty urban history of this controversial area located a stone’s throw from Parliament Hill, including an historic waterfall long ago dammed for industrial and hydro-electric purposes. The impact these trips had was evident: after the Rideau Canal field trip, one of the students took that on as their major research topic, and another did the same for Lebreton Flats. The St. Lawrence was the subject of the last field trip for this seminar, as well as the main trip for the first-year course I’m co-teaching this fall semester on the history of the St. Lawrence River and Seaway. This course is part of the unique First Year Program (FYP) at St. Lawrence University in upstate New York. As a truly interdisciplinary class, it is a unique pedagogical experience. The university provided a bus and driver for the whole day, as well as lunches. So a few weeks ago we met up at 8 am on a Saturday morning, passports in hand (don’t worry, we gave them the Thursday class off in exchange). We drove to the St. Lawrence at Waddington, NY and then headed east on the south shore, touring the Seaway locks, dams, and information center on Barnhart Island. Then it was across to Canada (with a surprisingly long and inefficient border detainment) and west from Cornwall to the former sites of the Lost Villages. 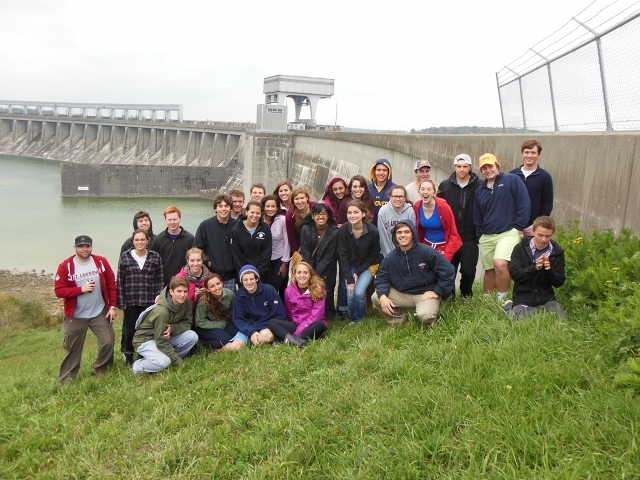 St. Lawrence University FYP class at Long Sault dam. After a detour into the Lost Villages Museum, which was in the midst of hosting a wedding, we walked into the river. That’s right – we walked into the river. 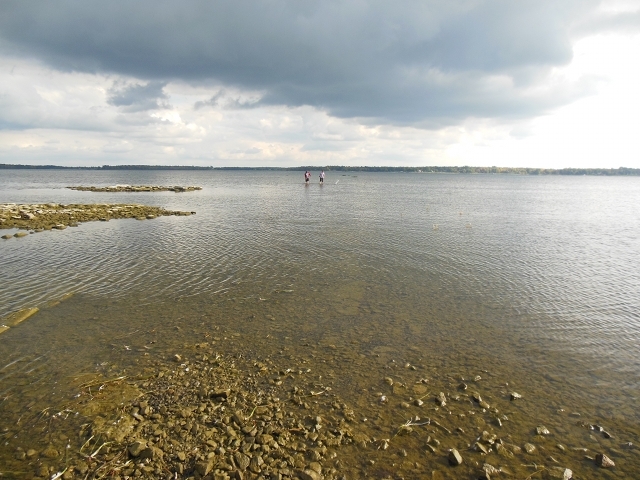 The water along much of the shoreline of Lake St. Lawrence, created by the flooding from the Seaway and Power Project, is quite shallow in many places; this means that some of the former communities – the Lost Villages – displaced by the St. Lawrence project are under only a few feet of water. The remains of the town of Aultsville, for example, are quite easy to find if you know where to look and if the water is low (and easy to see from the air if the water is clear – see the wonderful photography by Louis Helbig: http://www.louishelbig.com/sunkenvillagesst.html) Students really enjoyed walking among the remains of the foundations, roads, and sidewalks – you could see the proverbial light bulbs going on above their heads. Road into Aultsville. Note the building foundation on the left. Students made a number of connections with things they had read in class. 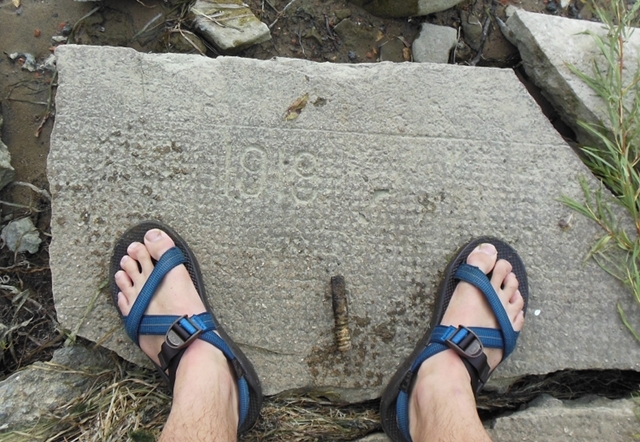 A few discovered the year “1918” stamped into a sidewalk sticking out of the water, and I in turn learned about ecological successions as revealed by the submerged bricks from the science majors. It was clear that the field trip got them more excited about the course topic, better conceptualize the scope and nature of the St. Lawrence Seaway and Power Project, and more fully understand environmental history. Daniel Macfarlane is a SSHRC postdoctoral fellow at Carleton University and Fulbright Visiting Research Chair in Canadian Studies for 2012-13 at St. Lawrence University and Michigan State University.